A lot has changed at the Middle Falls over the years. 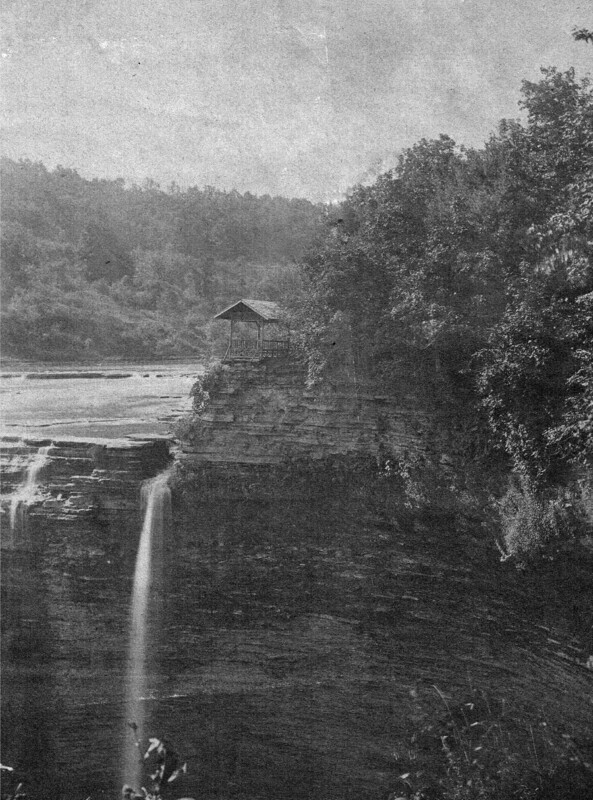 This photograph shows the rustic overlook Mr, Letchworth had constructed on the brink of the Falls some time probably around the 1880s. On the far bank of the river you can still see the trace of what had been the Genesee Valley Canal which had been replaced with what would become the "Pennsy" Railroad. Also interesting is the cut in the top of the Falls just to the left of the overlook. This could have been the results of a weakness in the rock which led to the formation of narrow channel in the rock feature. Remember, however, that mills once stood on that very bank. Early maps show a mill race, and Mildred Anderson mentions work to cut a race in the pioneer times. On page 21 of "Genesee Echoes" she relates how Alvah Palmer purchased "a mill power at the Falls for the purpose of building a sawmill. The first attempt to develop power was by excavating a raceway from the bring of the fall to a point some distance upstream. The breaking up of the rock was attempted by dropping a 96-pound iron ball from a considerable height. Powder was high in price and scarce, so was not used much. This crude attempt failed, and the river was finally dammed a little above the Middle Falls...."
Erosion has seemed to erase this once notable feature of the Falls. A close up of the overlook is found below. We thank our friend Karen Gibson Strang for sharing this image with us!